Happy 20th Birthday to the Public Web! This month marks 20 years since the Web’s public announcement in several online forums and the release of the WWW code library, libWWW. The library was a kind of “roll your own” tool kit that gave volunteer programmers the pieces they needed to write their own Web browsers and servers. Their efforts– over half a dozen browsers within 18 months– saved the poorly-funded Web project and kicked off the Web development community. LibWWW was written by main Web inventor Tim Berners-Lee and his technical assistant Jean-François Groff. The browsers it enabled included the Viola browser by Pei Wei, the Midas browser by Tony Johnson, and, later, the famous Mosaic browser by Marc Andreessen and Eric Bina at NCSA. Other important Web anniversaries are the first Web proposal (March 1989) and the first demo browser, server, and Web site (December 1990). 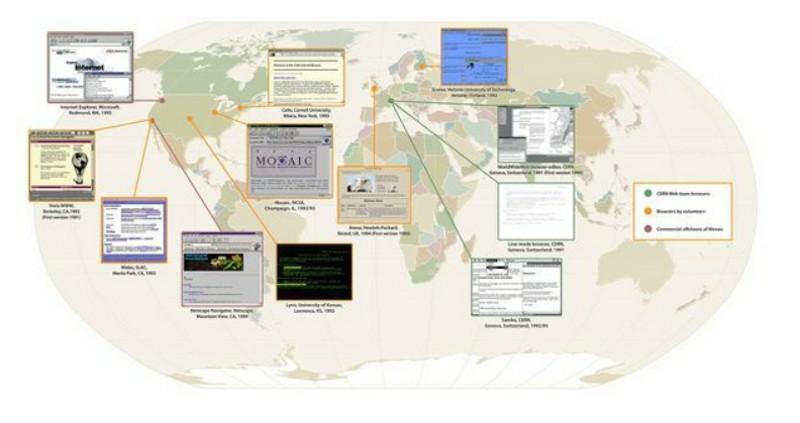 CHM’s Internet History Program preserves materials on the history of computer networking including the Web, the Internet, and the ideas that led up to them. Launched in 2009 by founding curator Marc Weber, this is one of the first programs of its kind at a major historical institution. The scope includes both technical history and impact on society. You can help the program identify materials world wide in need of preservation including software, screenshots, and oral histories.